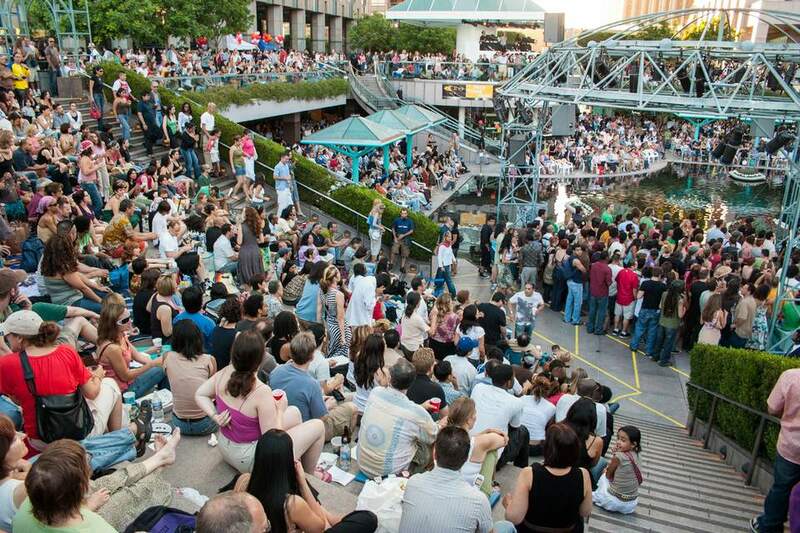 Grand Performances is a non-profit organization that organizes a series of free, high-quality world music concerts every summer in Downtown Los Angeles. Concerts are supported by grants and donations from the public. A concert schedule is published every spring. A paper copy is available if you sign up for their mailing list online or you can pick one up at a concert. Grand Performances brings in an interesting mix of musicians, dancers and storytellers every year, from Brazilian Samba to Rock en Español to Hip Hop to Afro-Cuban sounds and modern dance. Concerts are commonly scheduled Friday at noon, Friday and Saturday evenings and Sunday afternoons. There are sometimes concerts on other nights as well. Some groups have multiple performances. The Grand Performances concerts are held at California Plaza, an urban amphitheatre backed by a waterfall and banked by reflecting pools in a courtyard surrounded by skyscrapers. The stage is surrounded by several different seating areas. Across the pool directly in front of the stage, there are chairs set up. To the right (stage left), there is a semicircle of granite risers, which is sometimes used alone for smaller performances. The stage area in front of the risers is used for dancing during bigger concerts. To the left and a level above there are some permanent stone benches around the Plaza. To claim seats, people show up several hours early and picnic (see website for limits on what you can bring). The official seating areas open 2 hours before each performance. Beyond the seating provided, people bring their own folding chairs and blankets to set up in any free space. Popular concerts get really packed, so it's good to be there plenty early even if you're bringing your own chair. California Plaza is located just north of West 4th Street, between South Grand Avenue and South Olive Ave., behind the Museum of Contemporary Art and Omni Los Angeles Hotel. There is paid parking under California Plaza with an entrance off Olive Avenue (351 S. Olive Ave). Street parking is metered until 6 pm Monday through Saturday, but free after 6 pm and all day Sunday. Street parking is especially difficult for Thursday or Friday concerts. The best option is to take the Metro Red Line to Pershing Square. Exit toward 4th and Hill Street and walk uphill on 4th. There is an escalator up to California Plaza from the corner of 4th and Olive. Full-Service Restaurants on the Plaza. Blue Cow Kitchen and Bar has locally sourced seasonal bar food with patio seating and a bar. Noe is an upscale restaurant inside the Omni Hotel facing the Plaza featuring "a fresh and frequently rotating Neo Bistro menu" with an Asian flair. Mendocino Farms serves gourmet sandwiches including seasonal selections. Mixt Greens has good organic salads and a few sandwiches. Panda Express is Chinese fast food. Starbucks has prepackaged sandwiches as well as coffee. Pressed Juicery has cold-pressed juices. Ocho Mexican Grill is just across Grand Avenue from the Plaza at 3rd Street. Subway is also just across the street farther up Grand in the same building. Vespaio is an upscale Italian-American restaurant across the street between Subway and the Broad museum. Grand Central Market with over a dozen trendy restaurants is just down the hill on Hill Street, which you used to be able to access via the Angels Flight tram, but it's on perpetual hold, so you have to walk down a block's worth of stairs or around the block. For venues open for a drink or food after the concert, check out Where to Go After the Show.